The glimmering city of Dubai is home to a vast array of cultures that gives way to the most exotic culinary journey you are bound to experience. It’s where luxury and opulence are expected, where every national cuisine from around the world is served, and the food is nothing less of delicious. Add to this exceptional services, incredible views and all those little perks of dining in unique places and you’ve got yourself hundreds of options to choose from. Diverse, vibrant and simply high-angled – Dubai will take you on a gastronomical ride. If you want to know where to dine in Dubai this fall, I’ve got you covered. Here are some of my top picks. 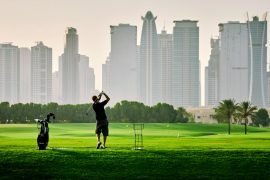 So here’s the thing – Dubai has no shortage of burgeoning views, piercing skyscrapers, indoor parks, and sprawling beaches. It would only be fair to treat yourself to lunch with a view. Perched on top of the 40th floor of the luxurious H Hotel, 40kong is set to impress. 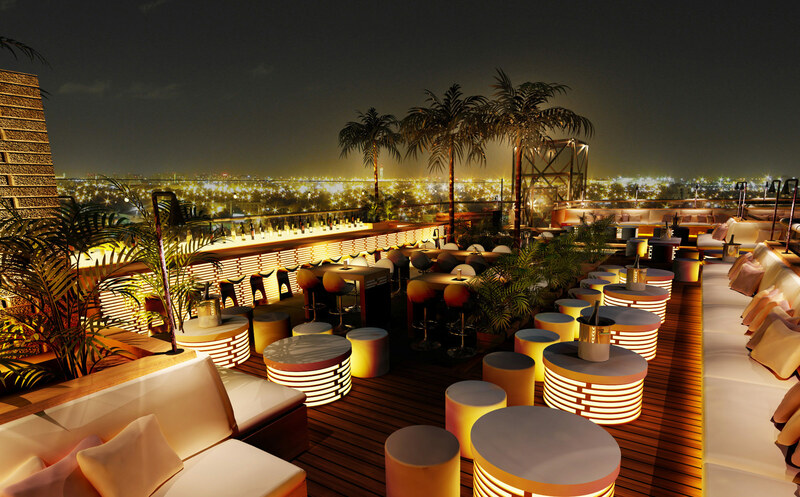 A rooftop bar serving international cuisine that is inspired by Asian flavors – 40kong’s cherry on top is the great view it offers of Dubai’s downtown area. Add to all of this a chic crowd from all over the world who come to mingle and socialize. 40kong serves as both a restaurant and a lounge bar, so whether you want to go for a quick meal or you want to drink until the wee hours of the morning – the place has got you covered. Main courses start from $30. The dress code is smart elegant, and it is open everyday from 7 pm until 3 am. Location: One Sheikh Zayed Road. 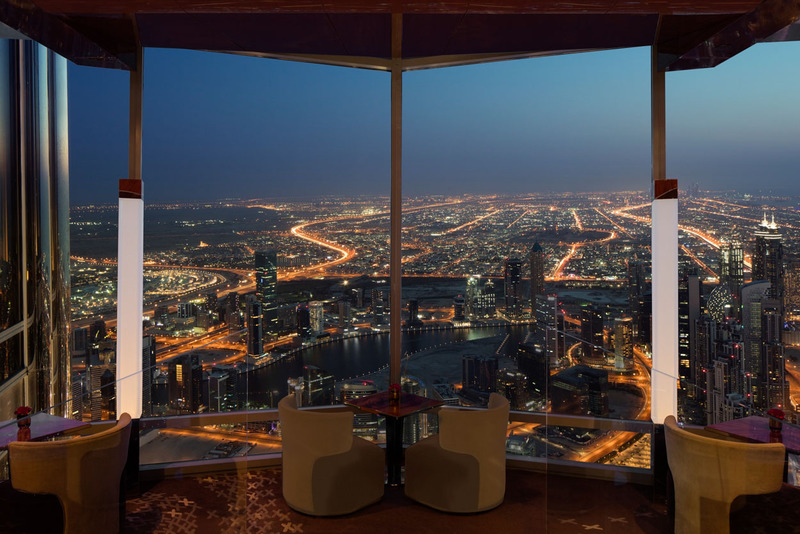 Located on the 19th floor of the Park Regis Kris Kin Hotel, Kris With A View has some of the best views of Dubai. Expect sprawling panoramic vistas of Dubai and the juxtaposition between the old Dubai and the new Dubai contrasting each other. The restaurant is a gastronomic voyage that takes you through the flavors and spices of Asia and The Middle East. From the tastes of India, China, Thailand, and Malaysia to the tastes of the Middle East – you’ll find everything you need. 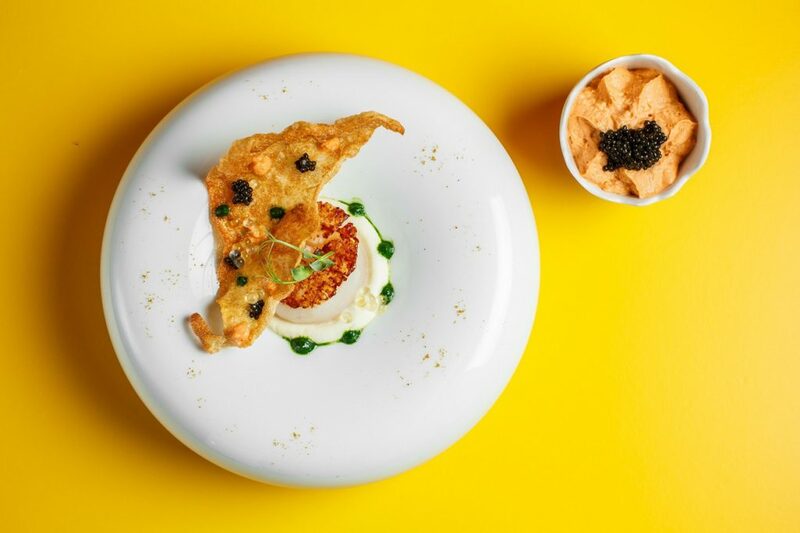 A visit to Kris With a View would not be complete without ordering some of its tempting appetizers and then indulging in an authentic main dish that explodes with flavors and spices. You can choose between an a la carte menu from 12 pm to 3 pm, or take part in the Thursday themed night buffet from 7 pm to 11 pm. You’ll also be serenaded by incredible live music so you can sip on a savory cocktail while taking in the panoramic views of Dubai. The epitome of fine dining can be found at Armani – a journey of pure luxury and sophistication. If you like your surroundings to be nothing short than stylish and chic, then this is definitely the place to go. Armani offers some of the best views of Burj Khalifa if you choose to sit outside (which I definitely recommend doing), and has a slick interior and exterior that emanates an Italian vibe. 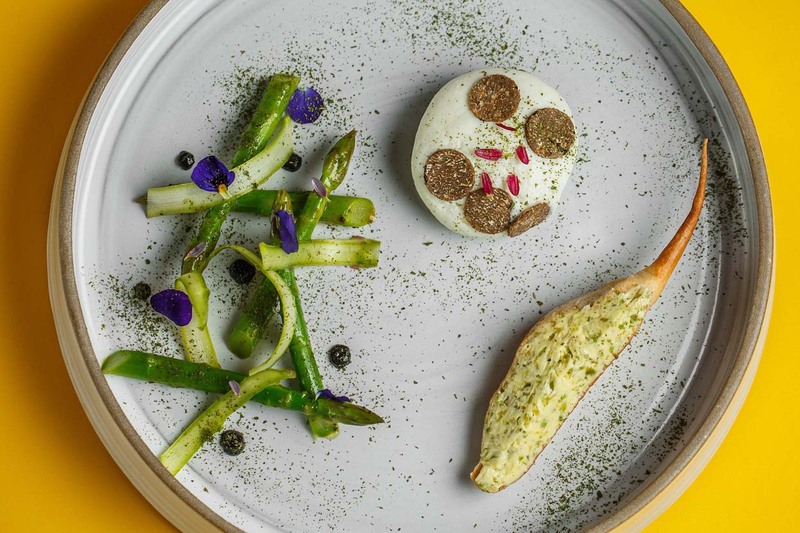 The food is quintessentially Italian and you can choose from burrata tartufo to capesante. You can choose from four or six course tasting menus and you don’t have to worry about the portion sizes at all. The views alone will make you aching to visit At.mosphere – but the views on its own are not the only prized assets of this restaurant. There is no doubt that At.Mosphere offers some of the best tasting menus in the region. You’ll be experiencing the shimmering lights of the whole city around you while enjoying some divine food – think incredible lobster, beautifully presented dishes, and a street food-meet-haute cuisine kind of vibe. The restaurant is also renowned for its dessert menu and also caters to vegetarians with a vegetarian tasting menu. Prices: Seven-course menu starts from AED 980 per person, while the addition of sparkling beverages takes the price to AED 1880 per person. The Five-Course Tasting Menu is AED 840 per person, and AED 1560 with sparkling beverages. Finally, the The Three-Course Menu is AED 680 per person. This list would not be complete without the mention of Muntaha. 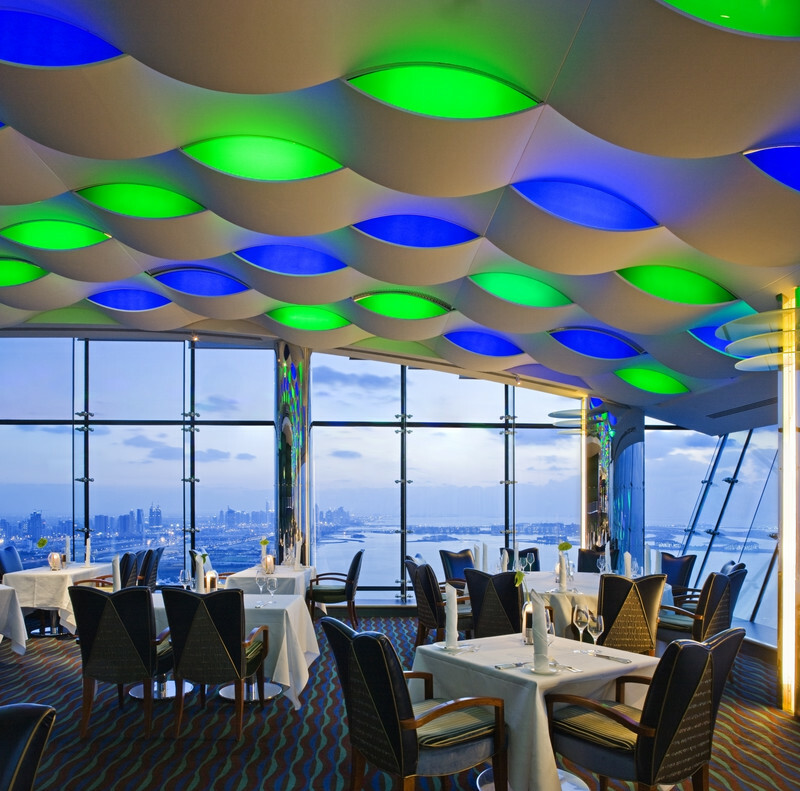 Located on the 27th floor of Burj Al Arab, the restaurant is located perfectly against the backdrop of a twinkling Dubai. Skyscrapers’ lights dance behind you while the buzz of Dubai disappears as you indulge in some of the best dishes around. The menu is elegant, simple and offers an unreal French flare. The average cost for eating at the restaurant is AED 1200 for two people and you can choose between a la carte, lunch, 3-course menu, 4-course menu and much more. 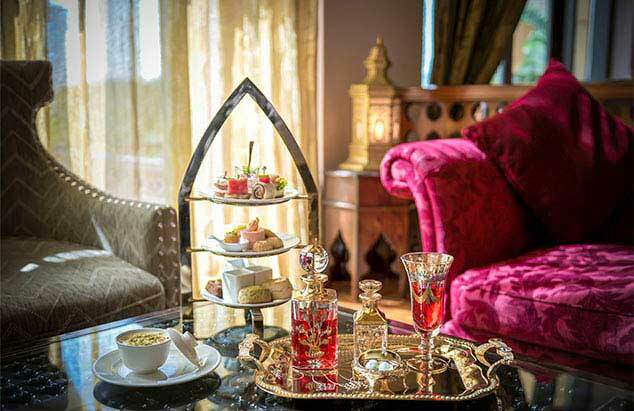 Located in Palace Downtown, going for afternoon tea at Al Bayt provides you with an authentic Arabic experience that takes you away from the glamor of Dubai and instead takes you to those traditional Arabian nights. 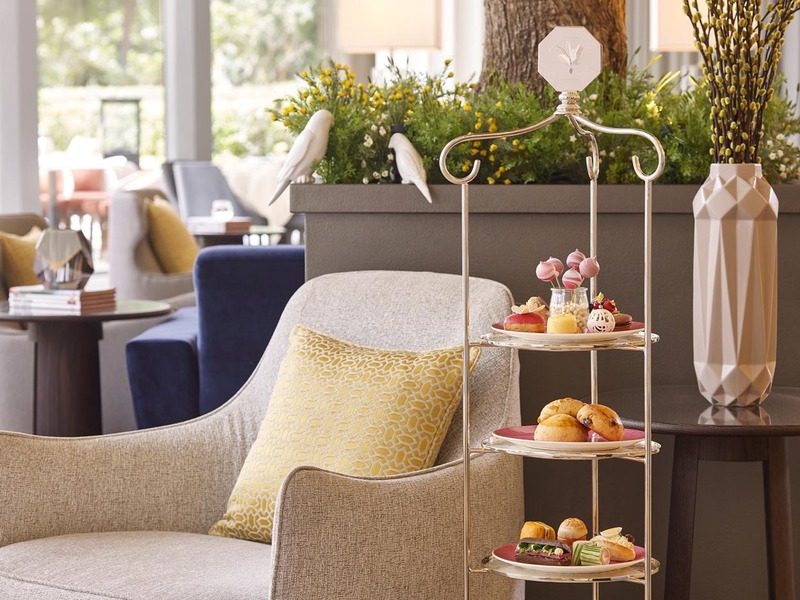 The afternoon tea comes with finger sandwiches, freshly baked scones and even comes with an option to choose decadent plates as well. Don’t miss out on the shawarma sandwiches. Not many places in Dubai can compete with the views you get there with your afternoon tea. Located right on the top floor of the enigmatic tower – you get to sip on savory tea with homemade jams, pastries and cake all while enjoying unreal views of the Palm and the World Islands beneath you. Combine your afternoon tea with a tasty brunch at Ranches, with a refreshing setting that gets you all ready for the rest of the day. The large terrace overlooks acres of the golf course with a backdrop of the lake, and the buffet includes everything from fresh juices, tea, pastries and delicious breakfast dishes. Cost: AED 135 per person, or AED 75 per child. 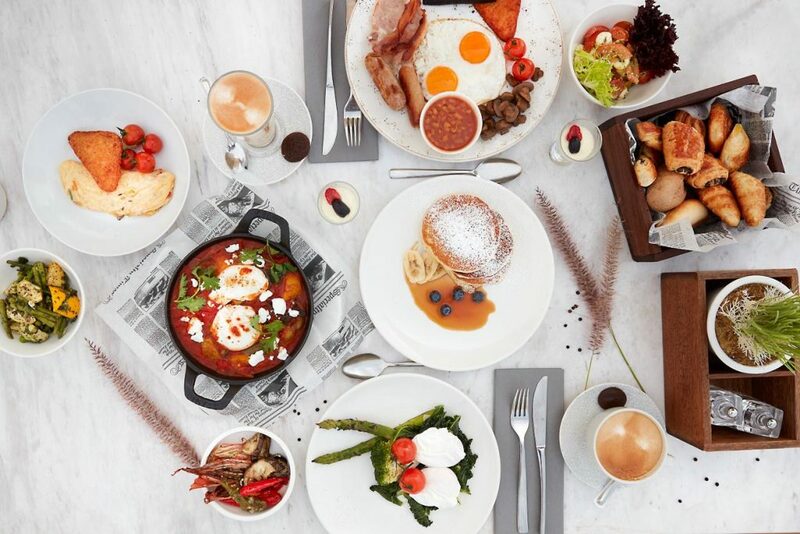 Vida Downtown brings you an NYC brunch straight to Dubai. The brunch menu features everything from eggs benedict, pancakes, omelets, avocado toast and much more from the timeless a-la-carte menu. Of course – add to this some bubbly treats like fruit medleys or your regular afternoon tea with a live DJ, and you’ve got yourself a new favorite brunch spot. An afternoon tea and spa package sounds like something straight out of movie but cannot be more real at Address Boulevard. 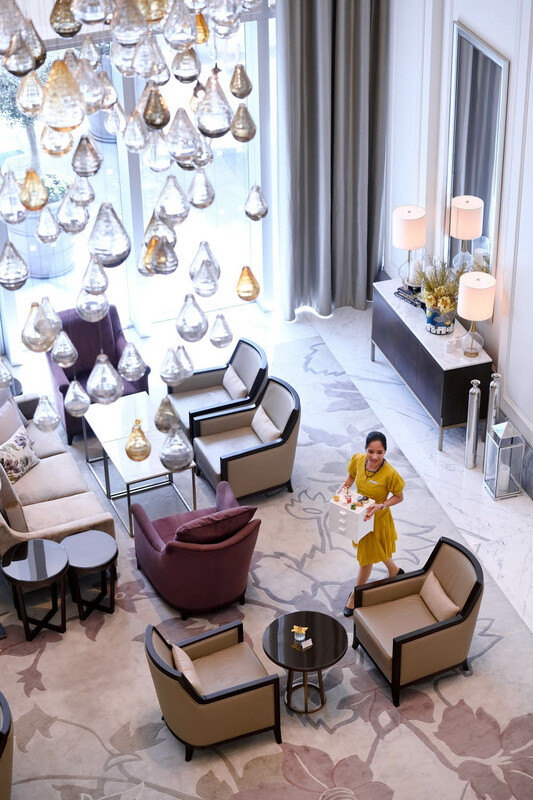 Get rid of your week’s stresses by indulging in an ultimately soothing experience with a 60-minute relaxing massage by a specialist followed by an excellent afternoon tea with the best delicacies around. The price is AED 469 per person, and is worth every minute of your time. 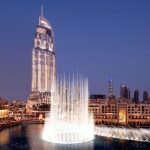 In the heart of the Address Downtown, lies an enthralling experience that comes with the perfect views of Burj Khalifa. 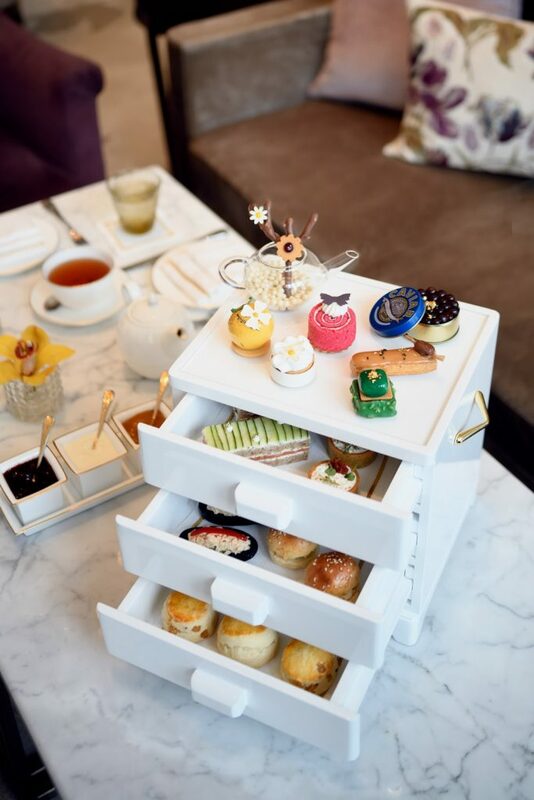 Hand-crafted sweet delicacies come with a delicious afternoon tea so you can escape from the hustle and bustle of Dubai. Fine food and taste are blended perfectly there. Price: AED 150 per person. 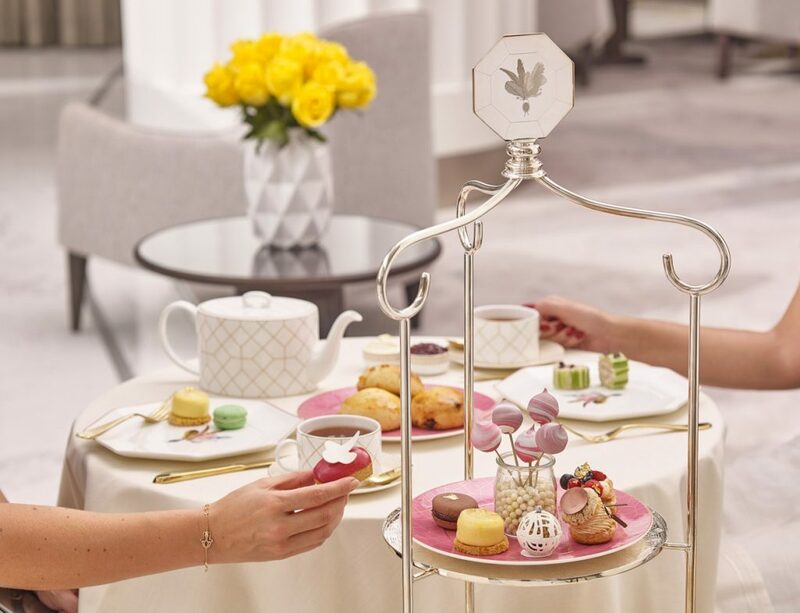 If you’re looking for a place to experience the elegant tradition of Afternoon Tea, then Shai Salon at the Four Seasons Resort Dubai is another great option. 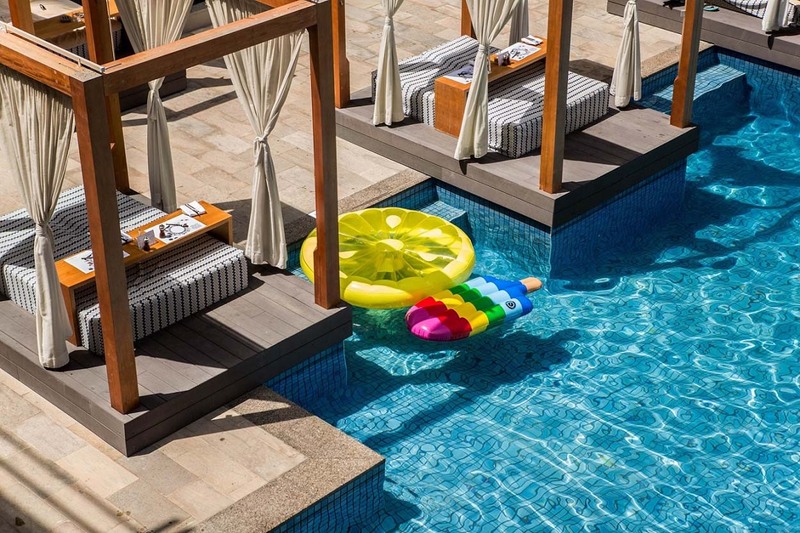 The area is quite intimate, and the Shai Terrace offers incredible sea views and comfy lounge furniture. I’ve saved the best for last…Add an incredible twist to your afternoon tea by indulging in a unique dining experience. 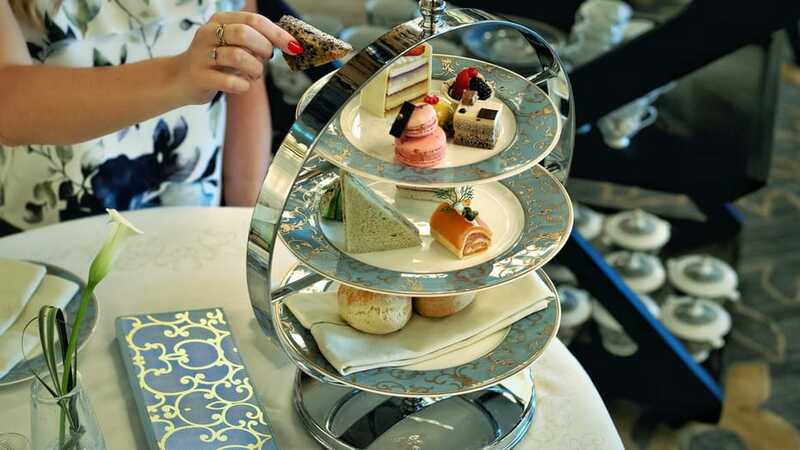 How does having your afternoon tea served with incredible delicacies while being suspended 50 meters above the ground sound like? High Tea in the Sky will give you the chance to take the perfect pictures and give you a good old dose of adrenaline as well. Dubai is filled to the brim with romantic places to dine. 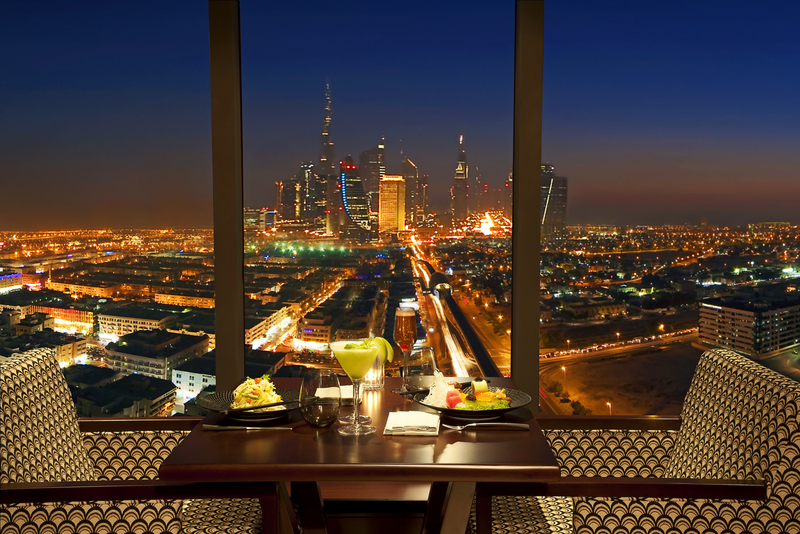 The romantic restaurants in Dubai are practically endless and you have a plethora of options to choose from. 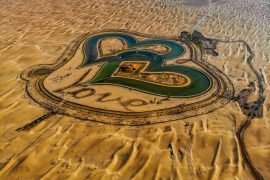 Whether you’re looking for highly intimate experiences, or casual-romantic ones – Dubai has it all. The world’s only seven-star hotel offers you an exclusive experience at Al Mahara. 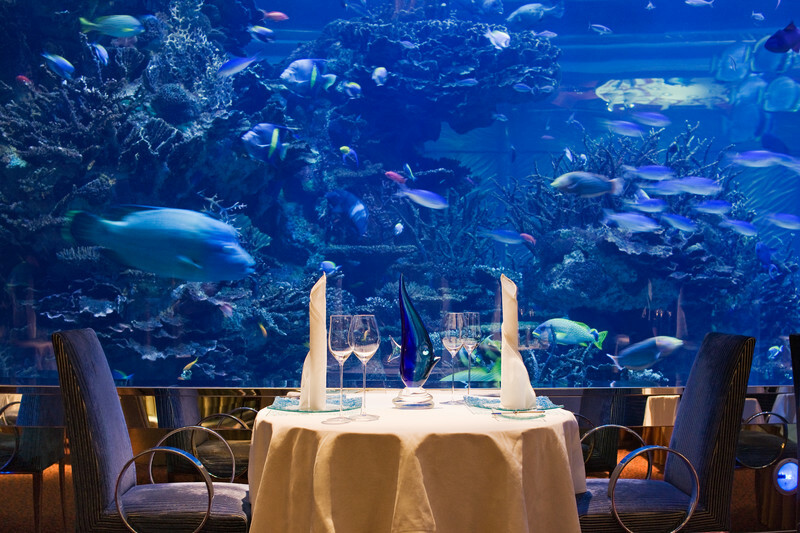 Forget about beautiful views and panoramic vistas, and forget about romantic music playing in the background – this restaurant allows you to dine under a giant aquarium. Savor on your food as hundreds of exotic fish, stingrays and sharks swim by with the candlelight setting the mood. The seafood is nothing less of incredible and the atmosphere is unparalleled and like nothing you will ever experience. 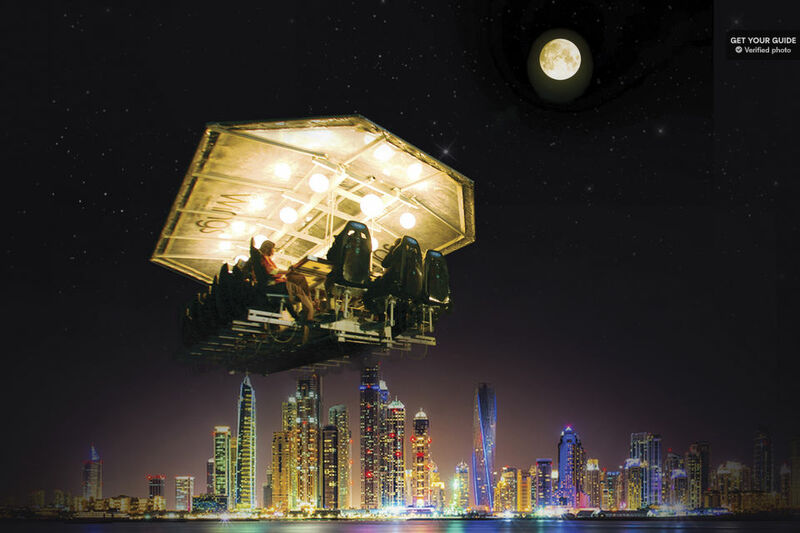 Prices start from AED5,350 per person. At.mosphere needs to be mentioned twice. 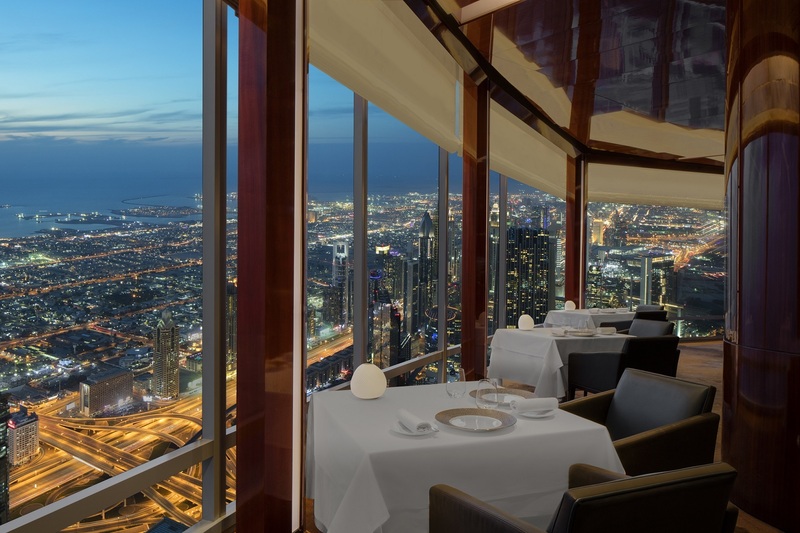 The world’s tallest restaurant offers incredible views that simply make any setting romantic. 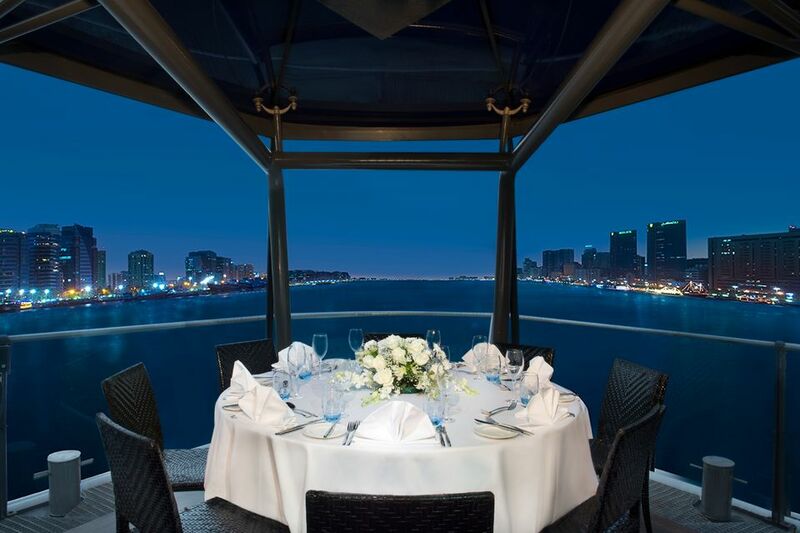 This romantic restaurant in Dubai offers a great European gastronomic experience where you can indulge in many of its signature dishes – from organic salmon gravlax from France to dry aged beef from Italy. 7-course meal starts from AED980 per person, and AED1880 with wine pairing. This is where you get to enjoy gourmet dinner, international food and admire the incredible views around you all at once. The 4-course menu includes seafood, meat, and even vegan options paired with Arabian desserts and a fine selection of drinks. Book your dinner cruise here. If you want a more traditional experience, I recommend the Dhow experience. The dhow is a Middle Eastern, authentic boat that allows you to savor on an incredible buffet while surrounded by the twinkling lights of Dubai from the water. 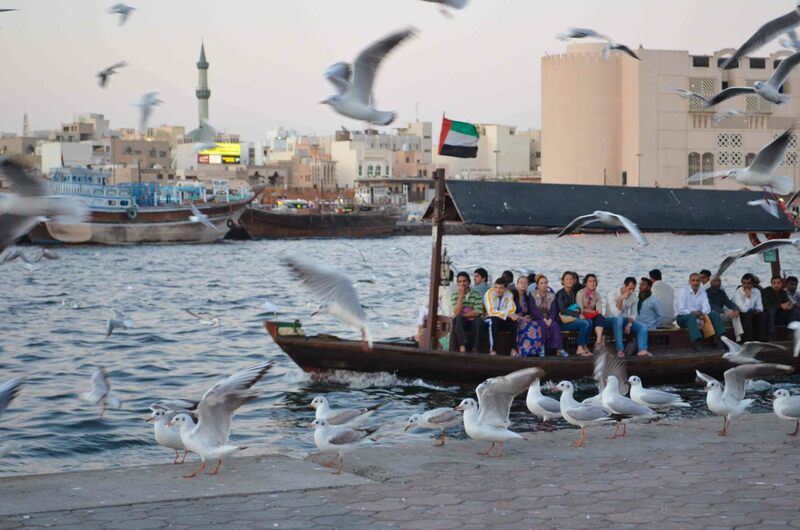 Book your dinner and dhow cruise here. Dubai has a lot more to offer than just its glitz and glamor – explore the intricacies of the Old Town with the winding streets of Al Bastakiya and indulge in the authentic Arabic experience. From souks filled with gold and spices, to wind tower houses, to the spirituality of the Jumeirah mosque – you can do it all and have a dinner with that. The 7-hour tour includes lunch at the luxurious Burj Al Arab. What is it about sunsets that make everything romantic? 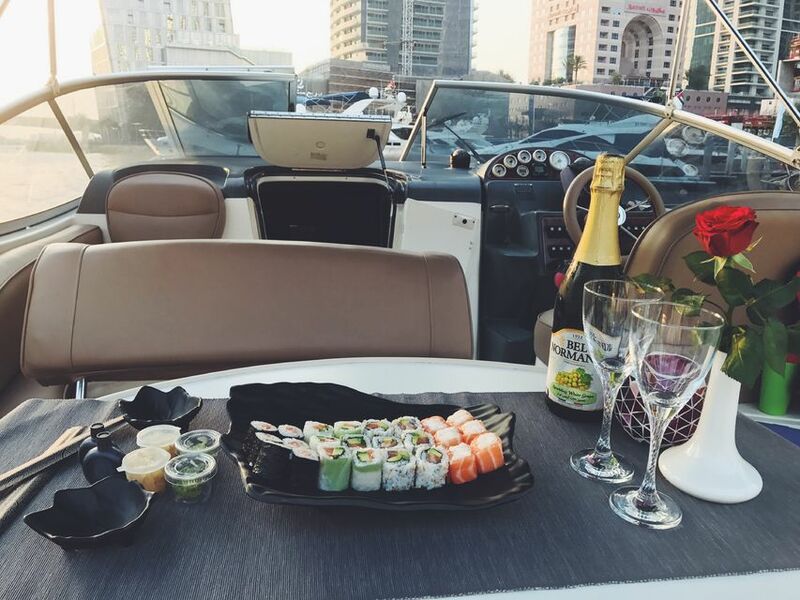 Indulge in the best sushi and drinks while surrounded by the sunset hues as you go on a romantic cruise with your loved one. The fairy-tale like experience is perfect for a proposal, a birthday or an anniversary dinner. 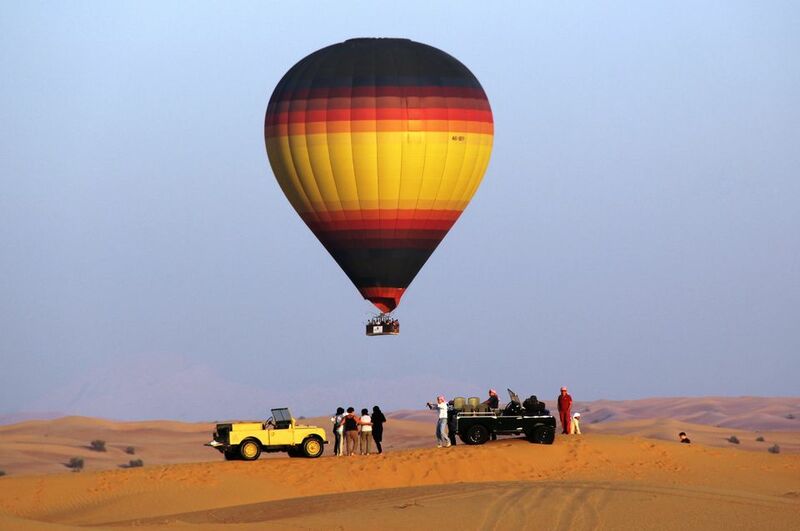 If you want to go all out, you can opt for a hot air balloon ride with spectacular views of the sprawling dessert from beneath you, mixed with an incredible gourmet breakfast. Book your unique experience here. The options may seem endless (and they are), so you’re in luck. Whether you want to have a romantic dinner in Dubai, spectacular views or a simple afternoon tea – there is nothing you won’t find in the city. 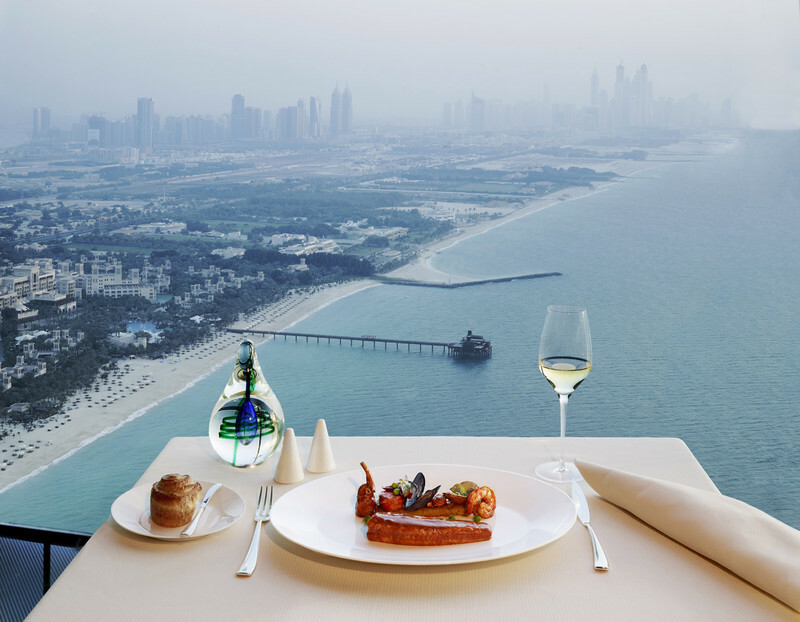 We hope that you have found this article on where to dine in Dubai useful. First time in Dubai? 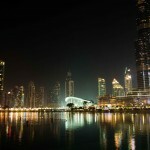 We hope our guide to Where to Stay in Dubai: The Best Areas will help you! 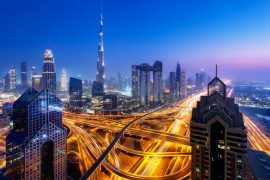 Wow Dubai…This be the amazing trip to Dubai…amazing places…like Hot Balloon Ride,Sunset Cruise, Especially Al Bayt place is just stunning just loved thank for posting! Your post is so interesting. I love Dubai city.